Tonight we’ll be all cheered up to ring in the New Year. Thank you all Bags of Charm customers for your support, trust and friendship. We look forwarded to seeing you in 2013 and bringing you more fabulous finds. May the New Year bring you joy, happiness and love. The sounds of Christmas music danced through the air & here comes to the time to celebrate, laugh, eat tasty food and all that. 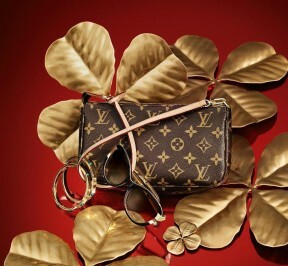 If the Louis Vuitotn Pochette Accessoires bag featured on Louis Vuitton wishlist photo is on your wish list, you can get a fabulous pre-owned one with LV dust bag for only $190 now from Bags of Charm. What a bargain! Louis Vuitton Idylle Romance bag was born a little over 2 years ago. The ultra feminine bag is beautifully crafted of Louis Vuitton Idylle canvas and contrasting calfskin leather trimmings, accented with Louis Vuitton rich golden metallic hardware. Louis Vuitton Idylle canvas line and Louis Vuitton Mini Lin canvas line look so similar. No wonder many people/websites mix these two up. But Idylle is actually an improved version of Mini Lin. The discontinued Monogram Mini Lin canvas line is a blend of cotton and linen. It expresses the Monogram signature on a natural, supple, light and hard-wearing jacquard. Launched in March 2010, monogram Idylle is distinguished by an innovative canvas that creates a remarkably soft, light a study cloth. The fabric is thicker, more sturdy and water/stain repellent. All items in Idylle canvas line are built to be several times more durable than the Mini Lin line. The change of name reflects its rebirth. French for ‘romance’, the discreetly elegant Monogram Idylle canvas is the ideal fit for urban and feminine lifestyles. “Capture fresh, laid-back elegance with the beautiful Louis Vuitton Idylle Romance Bag.” – from Louis Vuitton official website. This double dose of romance hobo is totally my type of bag – charming, lightweight, just the right size and very comfortable to wear. Don’t panic if you can’t find its date code inside the main body of the bag. Indeed, it is a bit tricky to find the date code of the Louis Vuitton Idylle Romance bag. There’s a deep exterior pocket on each side of the bag. Look into one of them. In between the seams, you’ll find the date code printed on a little leather patch as shown on the picture below:). 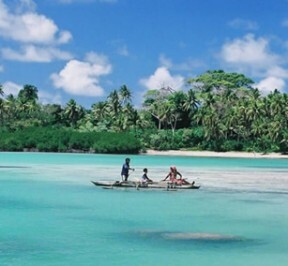 It’ll be fairly quiet here for the next week or so, as we are flying to this place… one week of white sand beach & tropical island with no phone, no Internet. Though you might not hear from me personally during this period, new orders will be dispatched on Thursday, 22 November. More new arrivals are scheduled to be listed on Sunday, 24 November. Happy Weekend everyone! The bag became hugely popular after photos of Grace Kelly appeared in a magazine and other famous fashion houses all produced similar styled bags later. A gorgeous polished golden GG logo pocket mirror with a leather case. That’s why we love high-end designer things – the attention to details. What else would make a better gift than this Gucci Kelly bag? New, but pre-owned so you still get it at hugely a discounted price. Be quick though, or I’m so taking that mirror. The other day I read an article: “Why Your Customers Left You.” It talked about how customers can get annoyed receiving too many newsletters. It is so true. Some times I receive 2 or 3 newsletter a day from the same store trying to sell me something and I had to clean up my email inbox all the time. But reading that article made me realize that we are exactly the opposite, we hardly ever sent any newsletter to our subscribers. 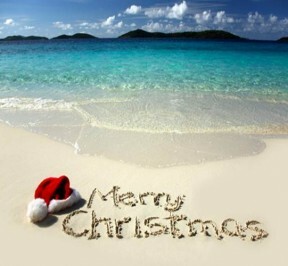 The only one newsletter we send was end of last year to wish everyone Merry Christmas/Happy New Year. You can tell I’m not from a sales/ marketing background, can you:). But we’ll try to keep in touch from now on, at least once a month. Bags of Charm is committed to bring you only fabulous, authentic pre-owned designer handbags and accessories @ fantastic value. This will never change. From the bottom of my heart, I thank everyone of you who stayed with us all these time and I want to let you know your support means the world to us. As a token of appreciation, Bags of Charm would like to offer our subscribers a 10% discount on all current stock including sales items. This offer is not available anywhere else and it is valid till the end of October 2012. If you haven’t subscribed to our newsletter yet and really want to save more on a fabulous, authentic Louis Vuitton bag, you can still sign up now to get your 10% off coupon coupon code. I mean handbags. 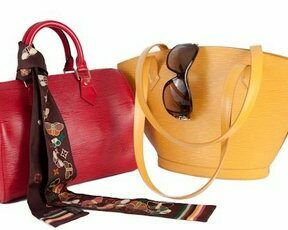 A lot Louis Vuittion handbags have sizes in GM (grand model), MM (medium model) and PM (petit model). I’ve noticed whenever we have all the 3 sizes in the same style; the GM bag normally gets snapped up first, especially these bags in the Louis Vuitton Monogram Canvas line.Louis Vuitton monogram Palermo bag has always been my favorite style since it was introduced in 2008. I like the feminine pleat design, the functional dual handles and detachable long shoulder strap. When it comes down to sizes, I can’t make up my mind which one I prefer. 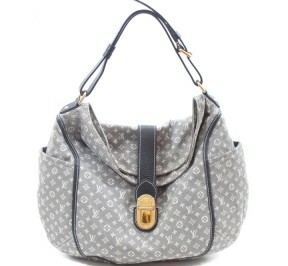 The Louis Vuitton Palermo bag has only 2 sizes, GM and PM. 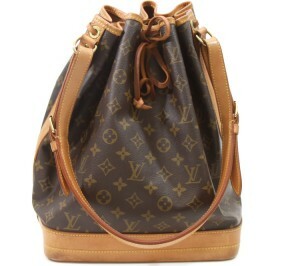 It is a bit unfair to call the Louis Vuitton Palermo bag PM “petit” because it is not small at all. With dimensions of 36 x 21 x 16cm, the bag is certainly roomy enough to hold everything you need easily. At 1.70m, I love how it fits on me as a daily bag. 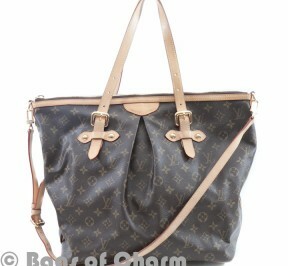 Louis Vuitton Palermo GM bag is much larger bag, measured at 45 x 36 x 20cm. It is definitely the dream bag of a girl who prefers big handbags with extra room for a thick jumper or jacket in the colder season. It is also good to use it as weekend bag. Decisions, decisions, decisions. Maybe just have both to make it simple☺. Do you always buy bigger handbags or smaller ones? If you got to choose between the 2 sizes of Louis Vuitton Palermo bags, will you go for the GM or PM (GM is on the right hand side)? Two people defined luxury costume jewellery in fashion history, Coco Chanel and Karl Lagerfeld. Today, Chanel is brand Chanel. 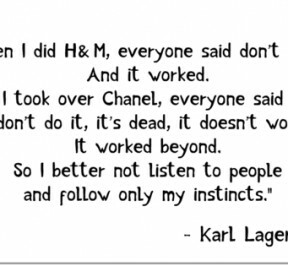 It is more like Lagerfeld –Chanel. Lagerfeld has been a busy busy man. He has designed for Chole, Fendi and many other prestigious brands; become artistic director of the House of Chanel since 1983; established his own label Lagerfeld/KL; created his own ad campaigns which he also photographed; designed costumes for theatrical productions and many films; opened a book store, then a publishing house. At the age of 68, Lagerfeld lost 42kg, in 13 months. This alone, is amazing. If Lagerfeld hasn’t done it, can you believe it’s even possible? So there it is. Follow one’s own instincts and just do it. Armed with strong determination and some hard work, what other people think not possible will be all achievable.